For this week's Peachy Keen Stamps challenge, the theme is Anything Goes! This is great, since I've been so busy, I didn't want to be limited when I sat down to create. I was itching to use one of my new sets from the May release. For my project, I'm using the PK-116 We Go Together stamp set. This fun little set not only features great greetings, but a couple cute faces as well. In addition to the stamp set, the card stocks, designer papers and embellishments are from the May Peachy Picks Paper Kit. I loved the colors in this set. I would equate it to the SU! colors of pool party, taken with teal (retired), riding hood red, daffodil delight and crumb cake. It's a fun color combo for sure! 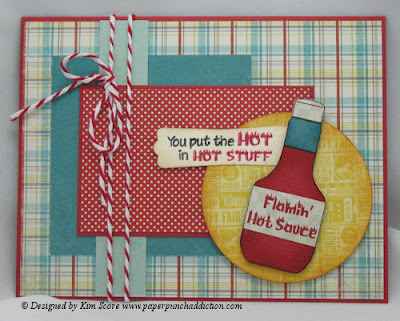 For the hot sauce, I paper pieced it by stamping the bottle on a piece of red and blue card stock and a checked print (for label and cap). Cut out the red bottle in it's entirety. Then, cut out the neck band from the blue bottle and glue that onto the red bottle. Last cut out the label and cap from the printed bottle and glue those on. To add depth, I sponged the edges of the red bottle with riding hood red ink and the neck band with not quite navy ink before gluing the pieces together. Stamp the label with riding hood red ink. I used a black and riding hood red marker to color the greeting and then stamped on a modern label punched piece. If you haven't seen them already, head over to Peachy Keen Stamps and check out all of the great stamps from the May release. They are perfect for all of those father's day projects! Want to see what the other girls on the challenge cooked up? Head over to the challenge site HERE. Wow, sooooo cute! Love the lo and the cheeryness! Love it, Kim! Super adorable! LOVE this Kim! You're right - those colors are FABULOUS together!!! And the twine is the perfect touch!